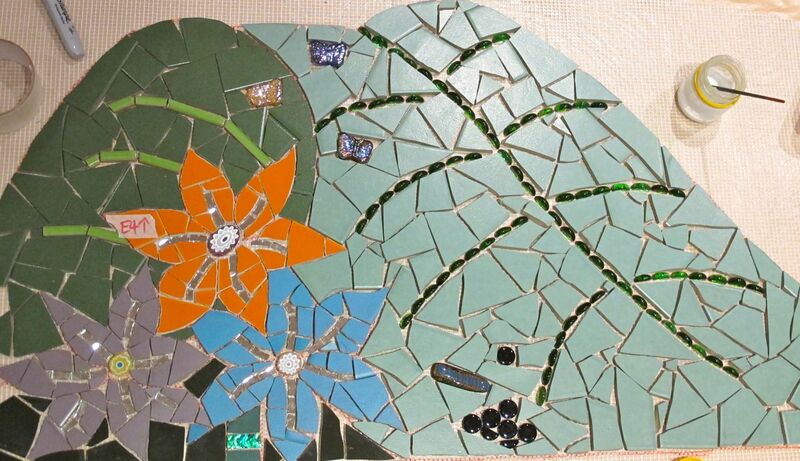 One of the great things about teaching mosaic workshops is that I get to meet some really wonderful people, all from different walks of life but we all converge over two days to explore mosaics. I feel so lucky! Really. So I decided that I would start a new series to spotlight some of my students. 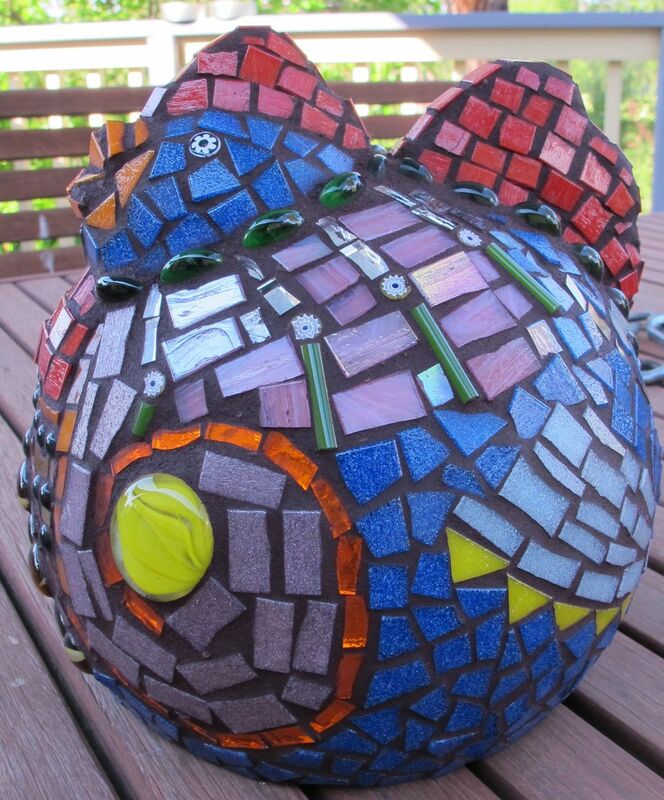 My first post in this series is to introduce you to Robyn Fetter, who came to mosaics late in life. She always had a latent interest in the art form but no time to indulge in it, or as she says no confidence to tackle it. 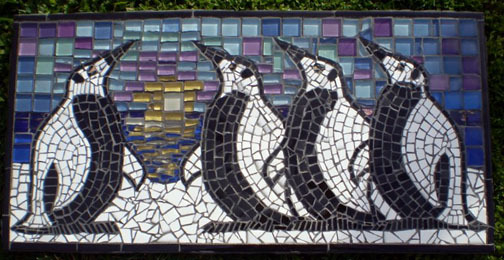 With the penguins, another Teresa Mills project, Robyn felt relaxed enough to play with the design and insert her own creativity with the sky and water. 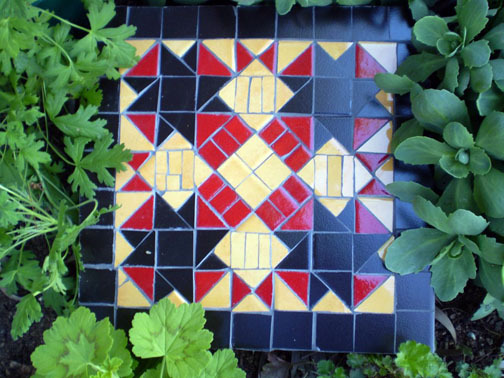 “You will be wondering what these works have to do with enhancing the paving in our garden. 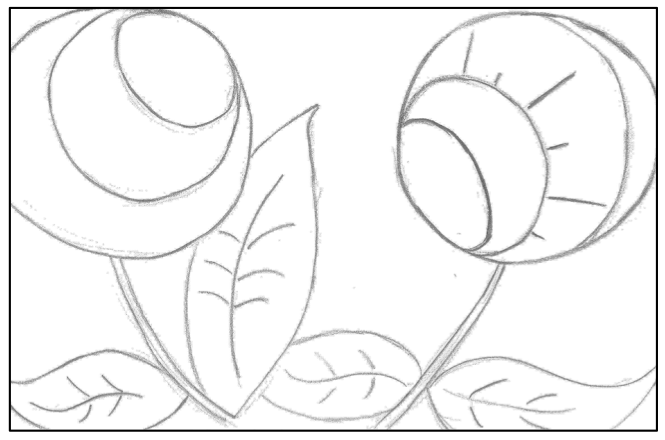 I’m intending for these practice efforts to hang on the fence, which also badly needs beautifying, and have made a start on decorative paving stones to be inserted in paving in the garden. Baby steps at the moment, but I have big plans.” 🙂 I never fail to get excited on hearing some one with “big plans”!! 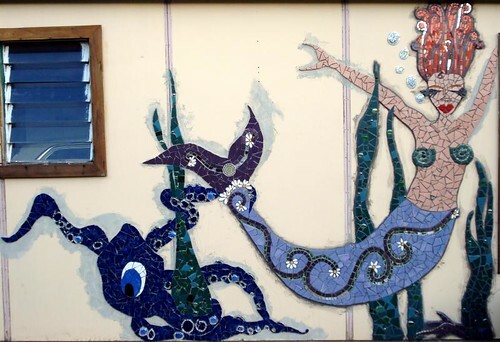 She is indeed very passionate and I look forward to seeing all her future mosaics! Thanks so much to Robyn for letting me profile her!! 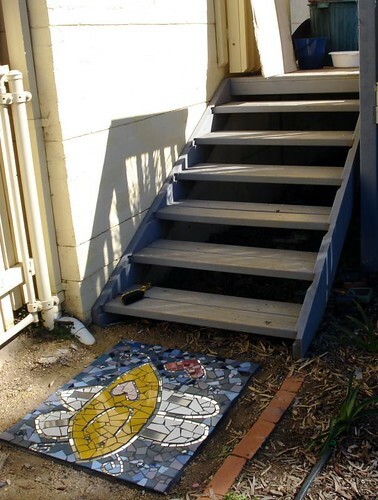 I will say it wasn’t without a little encouragement as she felt her mosaics were not ready. I disagree! They’re as fabulous as she is. Do you facebook? Somewhere I really spend (aka waste) waaaaay too much of my time, but I do like to know what is going on with all my friends OS, so it’s a great tool for exactly that. If you do – check out my page and become a fan! It was a lovely Sunday – cool Winter’s day with the sun shining down and warming my every being while I sat and worked non-stop. Well not quite sat. 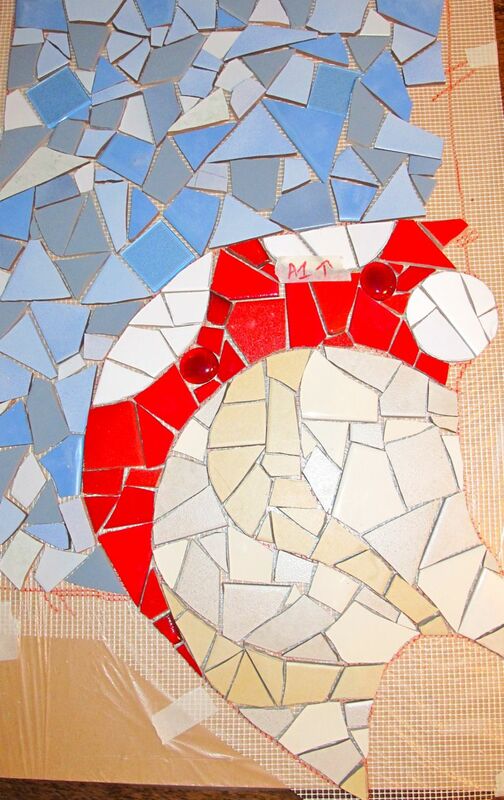 One also has to be an acrobat when wanting to be a mosaic artist. My Dad perched in his chair looking on, cooking lunch and falling in and out of sleep. Was a good day. Next in line, good pal Linda Martin who I had the pleasure of meeting in Sue Gianotti’s class at SAMA. It was a huge (but silent) wave and YAAAAAY!!!!! 😉 We hit it off immediately – but I think she has a way with people and hits it off with everyone she meets. Really a very special person – warm and generous. After that venture, Linda borrowed books from the library and studied them, researched the internet and spent hours studying other artists’ work. “I began to play around with breaking glass, dishes, and tile, ordering supplies and tools from the web, experimenting with everything I could get my hands on.” One of her first projects was covering a lava lamp with broken dishes which she called Shab-a-delic. “At the time I was quite pleased with myself, but looking at it now…. Ahhhhhhh!” LOL!!! Don’t we all have a million of them somewhere?! Linda also made lots of picture frames, and a license plate cover for her car, all of which she says fell apart as she was using the wrong materials. 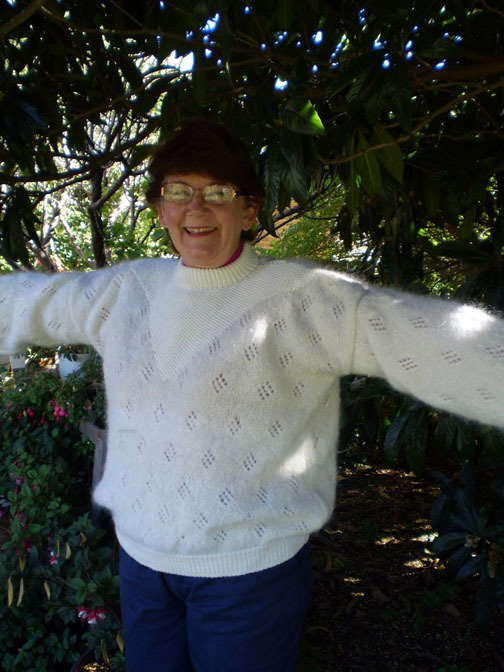 “These early projects took me forever to complete and were not very good, but I was having fun and learning.” I always say there’s no better way of learning than by doing… Her “coming-out” was with a mannequin titled “Courting Laura” which Linda entered into a fundraiser for breast cancer. 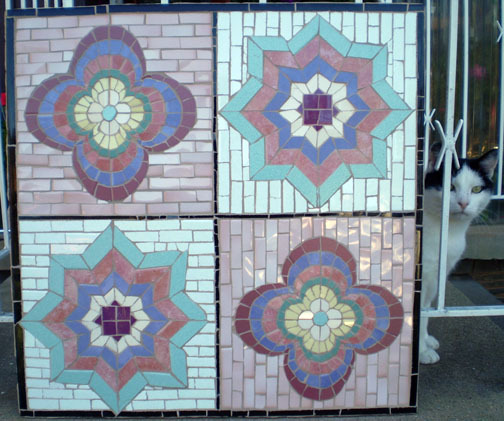 Linda’s mosaics can be seen this summer in the juried show “Art on the Wharf”, July 19th at the Santa Cruz Pier. A show consisting of only 30 artists. And finally, the artiste herself, sitting atop her community arts project she led also as an occupational therapist. 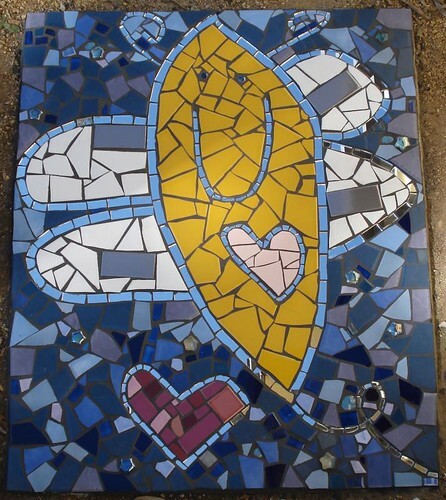 Jumping right back in, the next mosaic artist I wanted to highlight is Natalie Warne. Most of you, I’m certain, are aware of her work. I love how her art makes me feel. Don’t quite have my finger on exactly why… Anyway, let’s meet her! I must say reading through the info Natalie sent me, it was uncanny how many parallels there were in both our lives… it’s this weird occurrence which has happened with alot of the artists I’ve written about here. Natalie was born in Cyprus and resided there for the first couple years of her life. She moved around a fair bit until her parents settled in Plymouth, England at around the age of 5. Not being terribly excited by school, she went to college to do a ‘Nursery Nursing’ course and ended up studying art – this was her favourite subject. They used the Netherlands as their base, mainly there in the warmer months and travelled off to warmer pastures in the Winter months – Italy, Greece, Cyprus, Israel, Egypt. “…from Luxor we joined with some other travellers & hired a falucca to go down the Nile to Aswan. This was one of the best things we have ever done, we slept on the deck & it was amazing, the scenery, the floating hotels!!…”. Sounds divine! They continued on using the Netherlands as their base for another 6 or so years, during which time they also managed to get away to parts of South East Asia, India, even Hawaii. “Travelling to all these places & experiencing the diverse habitats, people & man made works of art (especially the Wats (temples) in Thailand, which are stunningly beautiful) & learning meditation & yogic breathing along the way, changed us both & led us towards a more spiritual/less material way of life.” Amen. Throughout this time, Natalie had started making jewellery: earring, necklaces etc all with semi-precious stones. Her Mum and herself decided to open up shop back in the UK – Totnes to be precise which is down in Devon (I lived in Salcombe for a short while, a beautiful little place close by…). This is how they ended back in the UK. Natalie is a self taught artist and believes this enhances her work as she is not limited by the rules that are applied in art. ” I did find the groups on Flickr & have found it most helpful to read the help & tips on these forums.” She has been concentrating on exhibiting her work over the past year, a solo show in her hometown of Totnes as well as sending off a piece to Ciel Gallery, located in the US.